It can be hard for first-time parents to know what toys are ideal for a newborn baby. For the first few weeks, babies are unable to hold toys in their hands and much prefer to look at things close to them. Very young babies don’t need lots of fancy toys – instead invest in a few quality toys which will amuse your baby for longer. In the review we have outlined the best kinds of toys to buy for your newborn, and picked some of the best available to save you the hard work. Many newborn baby toys are unisex, so you can start shopping even before you know the gender of your baby. A great toy for a newborn baby is a crib mobile, to help soothe them to sleep. Whilst they won’t be able to see the toy well in the early weeks, they will love to hear the gentle sounds these toys make. It is something your baby will enjoy for many months, and it will make your job a little easier at bedtime too! Newborn babies also benefit from a bouncy chair. This can make your life as a parent much easier, and is well worth investing in! You can safely leave your baby strapped into their chair when you need to make dinner or go to the bathroom. Play mats are great for the early months with your baby. These give you a safe place to let your baby play on the floor, and they will love to explore the different textures and sounds on the mat. Your baby will benefit from lying on his or her stomach for a short while each day, as this will help strengthen their neck muscles and help them learn to hold up their head. A toy for in the car seat or stroller is also great. There are some which clip onto the side of a car seat or stroller allowing your baby to reach or see the toy when they want. A cuddly toy is always a great choice for a very young baby. Some may also appreciate a comfort blanket instead. They will love to feel the comforting texture, and it may end up being a bedtime favorite for years to come. Make sure infants aren’t allowed to sleep with any toys until they are older, as they can lead to suffocation in rare cases. Short, simple stories with pictures are perfect for young babies. Whilst they won’t understand what you are saying for many months, they will love to hear the soothing rhythm of their parents’ voices reading them a story. There is a lot to consider when buying toys for a very young baby. Safety is very important for tiny babies. You’ll want to choose something which can withstand being chewed and thrown around a lot. It can be ideal to choose toys made by well-known, reputable bands so you can be sure they are of the highest-quality. Newborn babies like to look at high-contrast colors. Black and white is ideal, as are bold, strong patterns. For the first few weeks, babies can only clearly see a few inches in front of them, so it’s important to choose toys like this so they can focus. Make sure any equipment, such as a bouncing chair, you buy for your infant will support their fragile body properly. Make sure your child’s head and neck is well-supported when they are playing until they develop the muscles they need to hold their head up independently, to ensure they don’t injure themselves. This beautiful toy and book set would make the perfect gift for a newborn baby boy or girl. 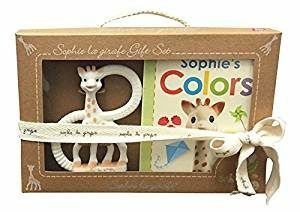 Sophie the Giraffe is one of the best-known teething toys for young babies and has a great reputation for producing the highest quality goods. The toy in this set is made completely from natural rubber. It is easy for young babies to hold, and safe to chew on. The teether is easy to clean, and is sure to last your child throughout all their teeth coming in. Babies will love to look at the different colors in the book, which will help with early color recognition. You can be sure it will give your child many years of enjoyment, as they learn to say the color names by themselves. The Sophie illustrations are sure to be popular with babies and toddlers of all ages. This is a great cloth book for newborns, which comes in a variety of designs, so you can collect them all as your baby grows. Very young babies will love to listen to their parents reading the word. Infants will begin to recognize animals at an early age with this book. As your baby develops more hand-eye co-ordination, they will love to turn the pages by themselves. The book is also great to help stimulate your baby’s vision. It has bold patterns and bright colors sure to attract their attention. The pictures in the book are high-contrast, making them ideal for the early weeks with your newborn. The book is short, so it’s perfect for very young infants with a short attention span. It is made of easy to clean washable material, so it can withstand being chewed on by your baby. The book also has different textures on the pages, to stimulate your baby’s senses. 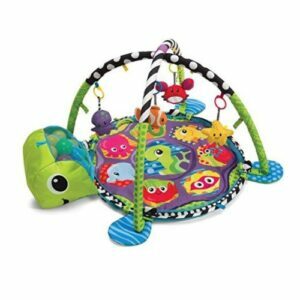 Lamaze is a well-established brand, known for producing very high-quality and entertaining baby toys. You can be sure that this toy is safe and will help your baby develop in many ways. The dragon toy features a handy clip, allowing it to be attached to a car seat or stroller for fun on the go. Your baby can learn about cause and effect with this toy – pulling the clip causes the dragon’s wings to flap. The toy also has a variety of textures so help develop your baby’s senses. There are crinkling and squeaking sounds, and six different fabrics. 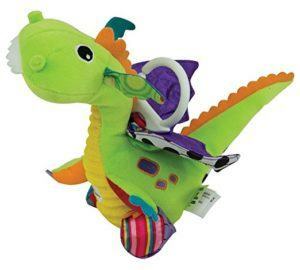 The dragon toy also has bright, bold colors and patterns to help your baby’s vision develop. These features encourage your baby to explore more, and learn independently. It will take your baby a few months before they are able to pull the dragon independently, but that means the toy will provide more months of entertainment for your infant! It is durable and easy to clean, so it can stand up to months of being played with every day. This is a great support for newborn babies, which can be used as a swing or a vibrating seat. 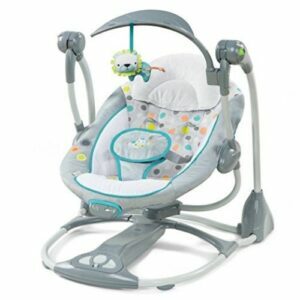 It offers varying swing speeds so you can find what is best for your baby. 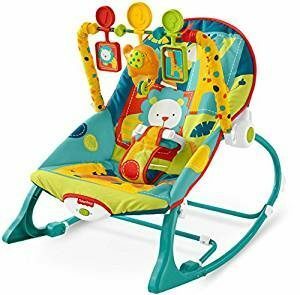 The seat also plays eight different tunes, and some nature sounds, so you are sure to find something to soothe your infant. The seat comes in a variety of colors and styles, each coming with a different animal toy. It is perfect for babies to use right from birth, as it is supportive, has a 5-point harness for safety and has non-slip feet. There is special technology in the seat which allows it to swing silently, perfect for sleeping babies. Parents will love that the swing seat folds flat – it can be easily stored away or taken to a friend’s house so your baby will always have somewhere to sit. The battery life of the seat is great, giving up to three times more use than rival companies. This rocker is perfect for babies of all ages – it grows with your child into the toddler years. It can be used for feeding your baby, or as a great place for them to take a short nap. The stand underneath can be folded out, allowing the seat to recline and stopping it from rocking. This is a great position for your baby to nap in, and the seat also vibrates to help soothe them off to sleep. 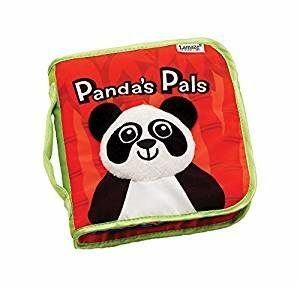 The bright, fun animal design is sure to grab your infant’s attention, and they will love to play with the removable toy bar as they relax in the seat. When your baby outgrows the toys, take the bar off and you will be left with a great seat for toddlers to climb in and out of independently. You get great value for money with this seat – it can be used by children weighing up to 40 pounds. The toys are quite close to the baby, so it’s perfect for newborns who can’t see very far ahead. After a few months your baby will be able to hit the toys to entertain themselves even more! This seat is great for parents too – you will love how easily the cover comes off for washing. This baby gym from Fisher-Price is great for all different kinds of play. It grows with your child, making it the perfect toy for babies up to 6 to 9 months old. There are lots of different textures for your baby to explore – it is ideal to prevent boredom and to stimulate the senses. Your baby will love to kick the piano as they lie on the mat. The toys hang at a perfect level for very young babies to reach. The toys include a teether, clackers and a large mirror for your baby to admire their reflection. The mat can also be used to make tummy time more interesting for your baby. The arch can be moved down so your child can still reach it when lying on his or her tummy. As your baby grows, the piano can be turned around so the baby can sit behind it and play using their hands. It can also detach from the mat for fun on the go! Parents will be pleased to know that there is a volume control on this toy, meaning your infant can play quietly if needed. This is a great play mat suitable for use from birth onwards. It is great for babies of all ages, as it can also be converted into a ball pit. Very young babies will love to lie on the comfortable mat and watch the toys hanging around them. Infants will develop motor skills by kicking and batting the toys, which make rattling noises. Parents will love the built-in storage compartment for the balls. It means they will always be handy when your baby wants to play. Once your baby has outgrown the toy arch, it can be removed leaving a perfect-sized ball pit. There are holes around the sides for your baby to pass balls through, further helping motor skills and hand-eye co-ordination. The Infantino play gym offers great value for money. It is two toys in one, sure to keep your baby entertained well into the first year and perhaps even beyond. 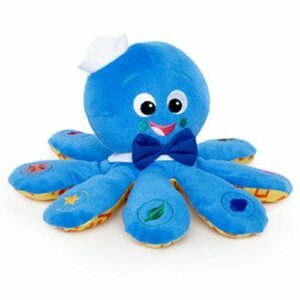 This cute octopus toy by Baby Einstein is perfect for newborn infants. 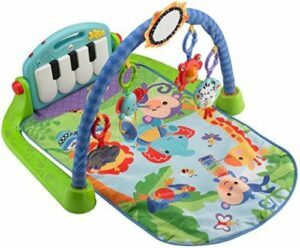 It offers different textures for baby to explore, and plays fun melodies sure to entertain your child. Each leg has a different colored object pictured on it. When your baby presses these buttons, the name of the color is said, followed by some classical music. This can help with early color recognition, and babies will love to dance to the music as they get older. The Baby Einstein toy is great for newborns, because the music can be activated just by hugging the octopus. The toy can be used in English, Spanish or French, making it perfect for developing very early language skills. Parents will be pleased to know there is a volume control, and the tunes are pleasant so they won’t become irritating like many baby toys! The strong patterns and bold colors of this toy make it perfect for stimulating newborn babies’ vision. The rattle set is great for helping your baby develop awareness of their own body. 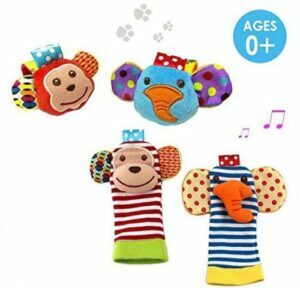 The toys also help develop babies’ sense of cause and effect, by rewarding them with rattling noises when they move a hand or foot. The rattles are made of soft, comfortable cotton which won’t irritate your newborn. The socks keep feet cozy, whilst the wrist rattles are easy to put on and take off, with Velcro fastenings. Parents will love to see their baby learn to recognize where each sound is coming from. The rattles aren’t too noisy, so they won’t annoy parents even after repeated use. The swing seat is one of the best toys available for newborn babies. Your little one will love relaxing to the soothing melodies played by the seat. Your life will be so much easier knowing you can safely leave your baby strapped into their seat. It comes with a cute toy for your baby to reach as they develop more hand-eye co-ordination and has loads of parent-friendly features you’re sure to love. If you are looking for a great baby toy on a budget, Lamaze’s dragon toy is perfect. Newborn babies will love to explore the different textures and sounds this toy makes. As your baby grows, they will develop the ability to pull the dragon and make the wings flap. This toy offers excellent value for money and is great for helping your baby’s development in lots of different areas.